So close to the most alliterated headline for this decade... But good for science! I wanted to keep going but it was getting ridiculous: "Methane in Martian Meteorites Might Mean... Metabolism on Maroon Mass! Maybe?" Wasn't this news story reported last year? I distinctively remember reading about this on The Escapist. Yeah, one of the first things I noticed was that odd orange globe looked nothing like Mars, even the colour is much too bright. Where's Vastitas Borealis, Valles Marineris, or the Tharsis Bulge? On topic, this is not exactly new but still exciting. Methane could be a pretty good indicator of life, especially if it's still being produced. Mars is geologically pretty inactive, so it is a little less likely the methane is being produced geologically. Oooh, life on Mars! Isn't that lovely? I must blow up the Earth now! Thanks for spotting that! I hadn't noticed CJ'd already written an article about space farts, though his was based on a different discovery. I'll add a link to his article in mine. Ha! This was my first thought, too. 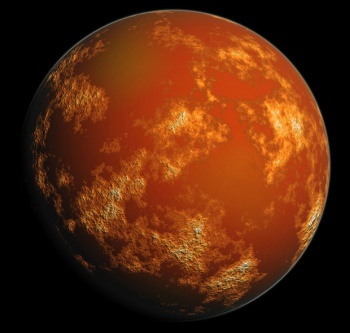 Martian Meteorite, Much-Maligned, Makes a Message of Methane, Meets Mortality. I'm getting tired of seeing all this "Might mean life" talk in the news. Every month a picture come back that "This could mean life!!" but it never does. "Look it that, it could be-- Oh, not it's not. Wait, look--! No... no, that's not life either. Oh my god, we may have found it this ti-- Damn! Hold on folks, we'll find it under one of these rocks." Well, this talk will eventually continue, until we find a full fledged martian guy, sincerely claiming he's is a real martian, and not some parallel universe liar or god-in-disguise deity. Or a wanderer from the future. Or even the three altogether. BTW, aren't the insects from Starship Troopers some subterranean species?